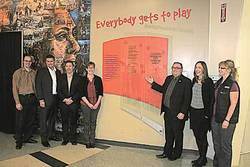 A Donor Wall was unveiled at the LRC in honour of the people and companies who have contributed to the Everybody Gets To Play program. Mayor Krischke stated that this wall, and the Everybody Gets To Play initiative, is a wholistic approach to health and wellness in Leduc, ensuring that no one gets left behind. Representatives of some of the program donors including those from MNP, Mixcor, the Boys and Girls Club, Mark Hayduk's family, and Mayor Krischke were present for the unveiling.